Week three was the first real challenge. The Summer heat has come in with a force, bring with it a lot of humidity as well. I found myself going out later and later in the evenings just find a comfortable heat index. On Thursday night, I didn’t head outdoors until 8:30pm. But the heat wasn’t the only problem. My right foot and ankle were hurting as well, and I wasn’t sure if I was coming down with shin splits. So, I decided to not head out on Wednesday and only walk on Thursday. Because of this, I am going to push back the next stage of the challenge by one week so I can reattempt the “1-run, 1-walk” stage. As can see, Wednesday was left black (for the reason noted above), and so was Friday. Friday was a golf day, and after 5 hours out in the heat and tackling 18-holes, I felt that it was an equivalent amount of exercise than an hour of running/walking. The average of 62 minutes for the approximate 4 miles is slightly better than the totals of stage one and stage two (64.2 minutes), so it is a sign that I am improving. Hills are still my weak point, however, and I need to build up those muscles if I am going to be able to complete the next stage of running the approximately 4 miles. 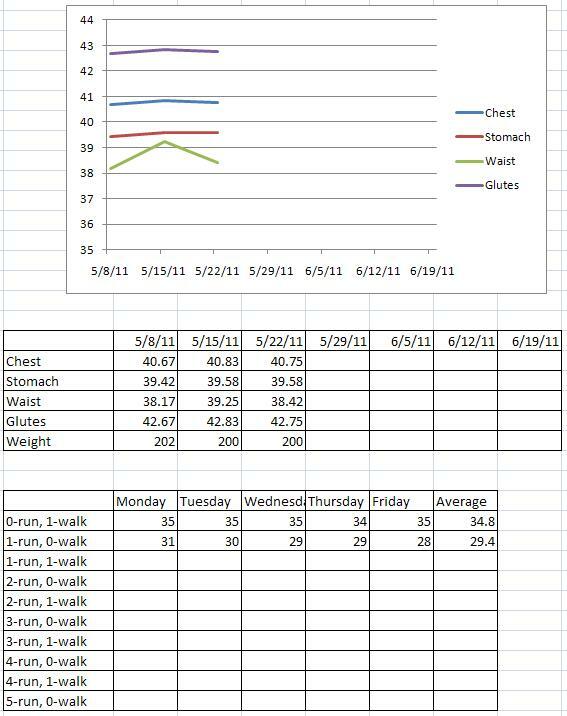 On a positive note, all the physical measurements (except for my stomach) saw a decrease. I am now down 3 pounds since the start of the 6-week challenge, and I’ve shed almost a half-inch from my waist. I would argue that a lot of this loss is water weight due to the amount that I was sweating this week. If that continues, I could possibly lose the five pounds by mid-June … especially if this heat continues. As you can see, all the stats remained the same or dropped (which wasn’t much of a surprised). After the bump last week, I expected lower figures this week – especially after starting the running portion of the challenge. Speaking of running … oh my goodness! On the first night of running, I thought I was going to die. I didn’t even get the first quarter of a mile under my belt before I was out of breath (it didn’t help that it was raining much of the week as well). The thighs were also sore by the end of the week, but fortunately my bad knee and feet held up. After the first night, I did start to increase the distance I was able to run each night, though I wasn’t able to run the full 2.2 miles at any point. With the new week bringing an additional 1.75 miles (walking) to the mix, I hope to be able to run the first lap straight by Friday. I was averaging 13 minutes and 22 seconds a mile running last week. Let’s see if we can get that down to 12.5 minutes by Friday. As we’ve seen in past challenges, the first week tends to see the measurements go UP for some reason, but eventually goes down, so I’m not too concerned by the increase. However, the weight did go down a surprising 2 pounds. It could be that either last week or this week’s measurement might be an outliner, but taken for what it is, it’s a nice change. Coming up this week will be the first week of running. Unfortunately, looking at the weather forecast, it should also be raining (with a chance of thunderstorms) all week. I guess this will be trial by fire. If I can do my first week of running in the rain, then I should be able to continue running when it’s dry. Well … here goes nothing! The never-ending quest to lose those pesky five pounds continues. This time, it’s not really a six-week challenge as much as it is a six-month challenge. A coworker has asked if I would join him in this years Tough Mudder – a 10-mile off-road obstacle course. Running has never been my strong suit, so it’s going to take some time to get into shape (if I do take him up on his offer). I went ahead and bought a pair of new running shoes with help from a running professional, so my flat feet should be able to handle all the impact. Now I’m in the process of breaking the shoes in. Week 1 – Walk the first lap (2.2 miles). Week 2 – Jog the first lap (2.2 miles). Week 3 – Jog the first lap, walk the second (3.95 miles). Week 4 – Jog the first two laps (3.95 miles). Week 5 – Jog the first two laps, walk the third (5.7 miles). Week 6 – Jog the first three laps (5.7 miles). Week 7 – Jog the first three laps, walk the fourth (7.45 miles). Week 8 – Jog the first four laps (7.45 miles). Week 9 – Jog the first four laps, walk the fifth (9.2 miles). Week 10 – Jog the first five laps (9.2 miles). From that point on, I will be mixing in strength exercises with the running. Since the event will require carrying logs, climbing walls, and negotiating monkey bars, I’ll be working on pull-ups and probably push-ups. Hopefully that will be enough to get me up to speed with my coworker. 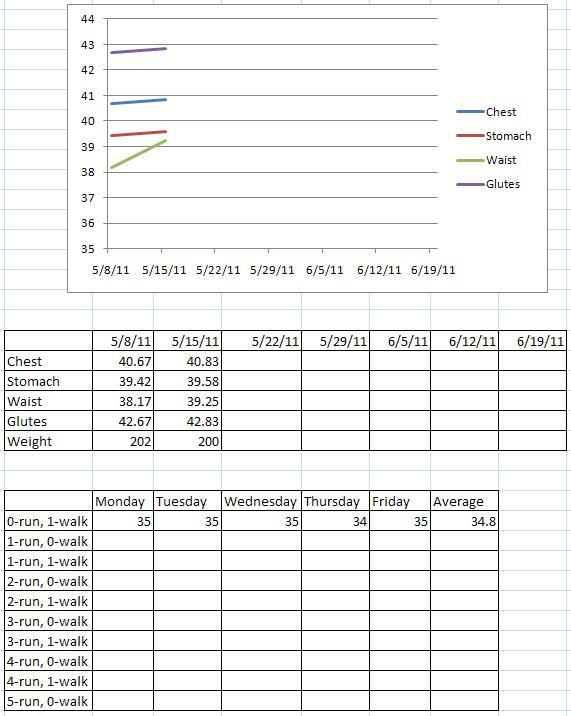 As with all the prior six-week challenges, I’ll be keeping track of my weight and measurements at four key points: chest, stomach, waist, and glutes. A chart and graph will be updated periodically so we can see where improvements are being made. Maybe I’ll finally shed those five pounds once and for all! This is definitely a great day/week for the United States. Not that we should ever rejoice in the death of an individual, but the removal of Osama Bin Laden from the equation in the War on Terror is definitely an emotional and strategic boost for the nation. Congratulations to all the hard work over the past 9+ years by our intelligence, military personnel, and government contractors. Keep up the good work! As you know, I put a lot of work into my yard. Trying to get grass to grow (as well some of my plants) isn’t as easy as you would think it should be. I’ve even come close to throwing in the towel and simply put down mulch to cover over the bare spots. But since I live on the fringe of the woods, I want to try to maintain as much of the natural beauty as possible. Of course, my development wouldn’t exist without destroying the natural beauty that existed. With progress comes some sort of destruction, and that is what is currently going on with the new development that is being built near my house. Every day, when I drive passed the construction site, more and more trees are gone, and more dirt has been moved to level out the original hill that existed there. But even with this destruction comes a bit of beauty … if you’re an engineer like I use to be. The size and shapes of some of the equipment they’ve brought in to do the site development are impressive. I’ve seen Volvo dump trucks, tree mulchers (see photo), and even JCB backhoes. In just a few days, they were able to clear-cut approximately 20 acres and are currently leveling the lot. In the past, it would have taken an army of wood cutters to do all this work, but now they can do it with about 20 or 30 workers. Very impressive. But while it is impressive, I wish they would have done a better job of preserving the existing trees and build the new homes around them. That is what the developers of our neighborhood did, and we are surrounded by full-growth trees. It will take 20 years to recover (environmentally) the amount of damage the site developer has done. I know it is cheaper to do it this way, but there is value to be saved by saving at least “some” of the trees. I just love this song. Very light, sweet, and upbeat. The video matches the mood of the music as well, with people having a good time down at the beach. Hope you love it too! You are currently browsing the MODU's Musings blog archives for May, 2011.